Hey everyone! I am guest designing over on the Brutus Monroe blog today! 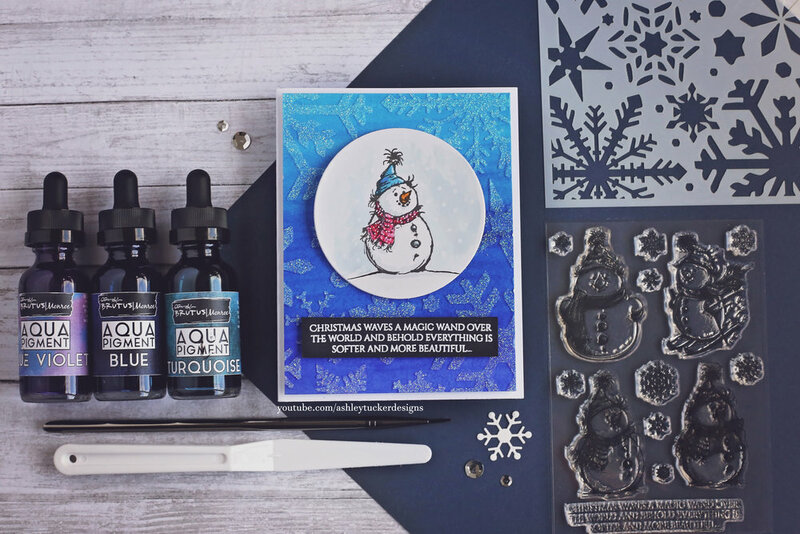 I created a sparkly Christmas card featuring some of their products! I started by taping a piece of Canson watercolor paper to a board. I blended together three colors of Aqua Pigment watercolors to make a vibrant background. This is my very first time using a liquid watercolor and I loved it! I used the colors Turquoise, Blue, and Blue Violet. Once the paint was completely dry I taped a snowflake stencil from Brutus Monroe over the background. I went over the stencil with some Nuvo Moonstone glimmer paste. I removed the stencil while the paste was still wet and cleaned it immediately. I set aside the background to dry while I worked on the next part. Next I stamped a snowman from the Snow Friends stamp set. I stamped it using my MISTI tool on some Bristol Smooth paper with Raven ink from Brutus Monroe. 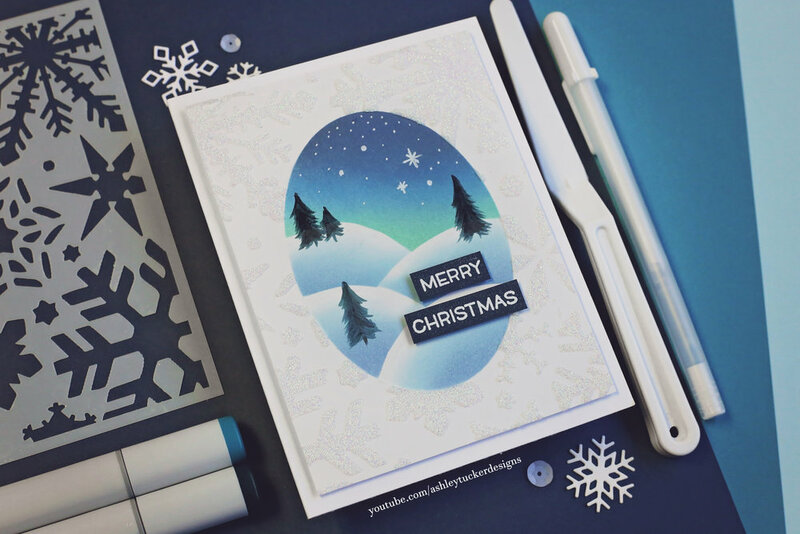 I painted the snowman with Aqua Pigment paints and then cut it out with a circle die. 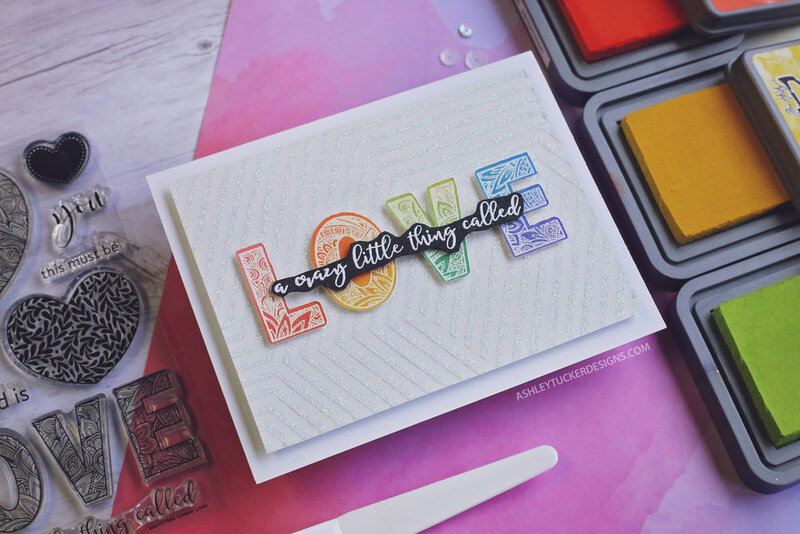 I stamped the sentiment from the Snow Friends stamp set on some Bazzill Licorice Twist cardstock with Versmark ink. I embossed it with Brutus Monroe Alabaster embossing powder and then cut the paper into a strip. To put the card together I took an A2 size card base and popped up my background panel with foam tape. Next I popped up the sentiment and the snowman circle. To finish up the card I added some highlights and details to the snowman with a white gel pen. I also added some snow to the background of the circle with the gel pen. Finally, I went over the snowman and the snow with a Wink of Stella glitter pen. For today’s card I used some Distress Oxide ink to blend a winter sky as well as a few different stamp sets from Mama Elephant’s newest release. I started out by blending a few different colors of Distress Oxide ink onto a piece of Bristol Smooth paper. I used the colors Picked Raspberry, Wilted Violet, Salty Ocean, and Black Soot. Once the blending was done I used my heat tool to make sure the ink was completely dry. 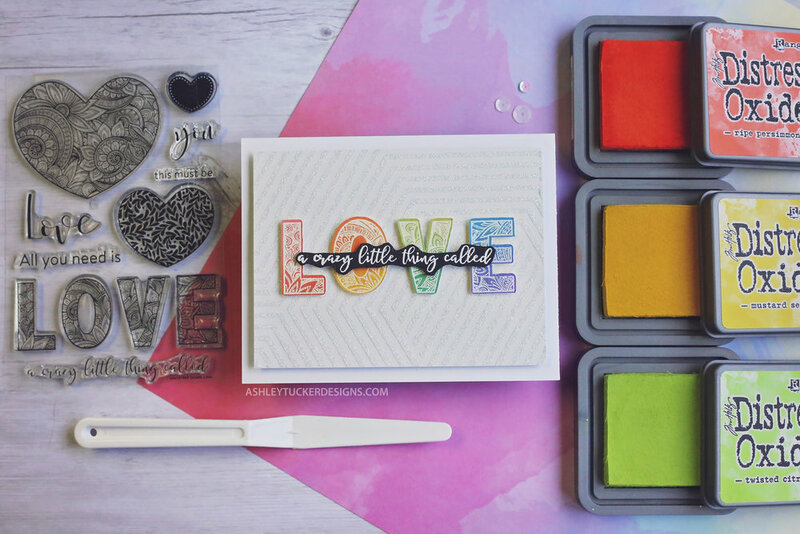 I prepped the paper with my powder tool and stamped a sentiment with Versamark ink. I then embossed it with a white embossing powder. 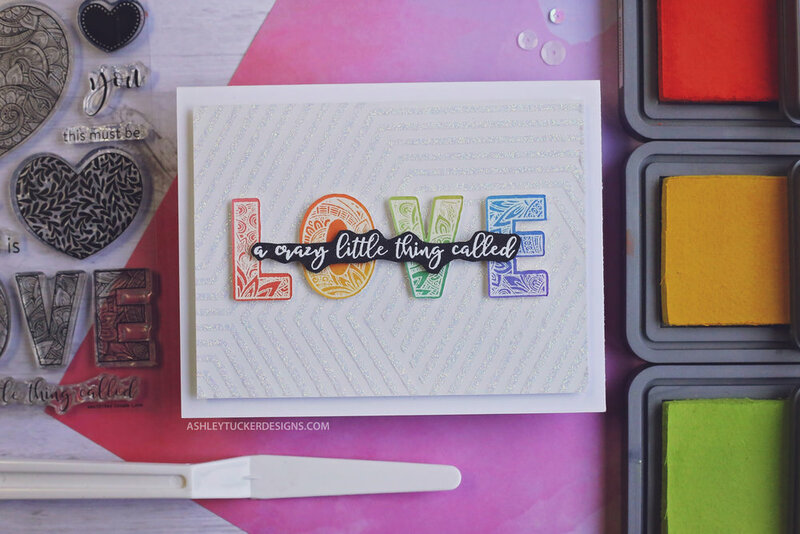 I picked out a circle die that was slightly bigger than the sentiment and cut some masking paper with it. I placed that circle of masking paper over the sentiment and then taped down my paper to a board. Next I used a stencil with a bunch of circles on it and placed it over the panel. I went over the stencil with Nuvo Moonstone Glitter Paste. While the glitter paste was drying I stamped the cute little kitty snowman from the Mama Elephant stamp set “Yappy Woofmas” on some Neenah Solar White card stock. I colored the snowman in with my Copic markers. Check out the video for all of the coloring details! I cut out the kitty snowmans with my Scan N Cut 2. Using some scissors I cut a curvy line across an A2 size piece of card stock. 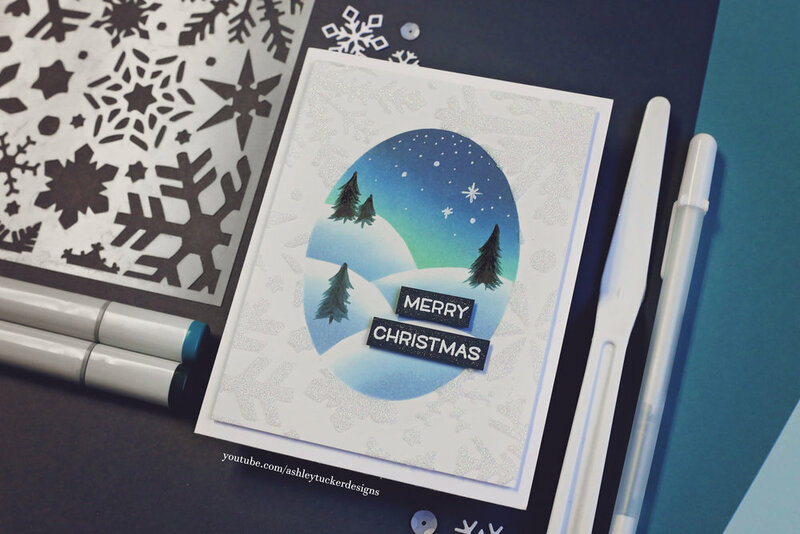 This created a nice snowy ground for my card. I took my Distess Oxide panel and adhered it to a card base with my ATG gun. Next I popped up my snow covered ground along the bottom of the card base with foam tape. I glued the kitty snowman onto the ground. I used a light blue Copic marker to add a drop shadow for the snowman. 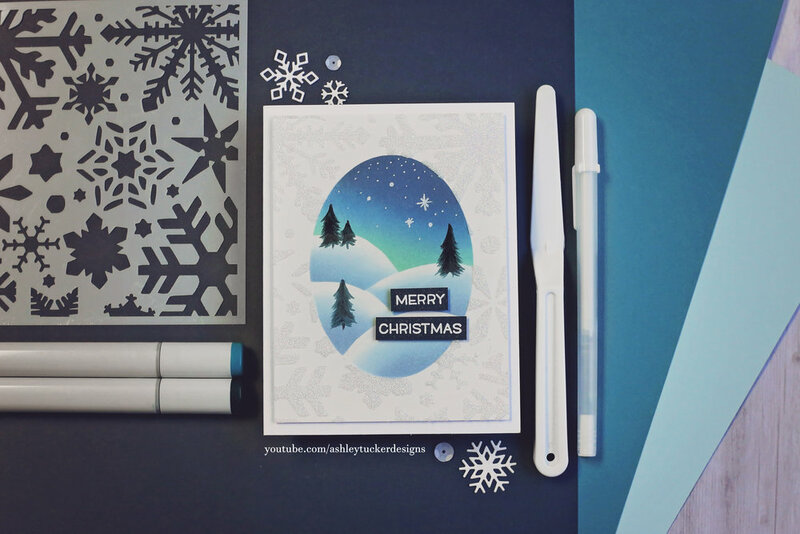 To finish up the card I added a few highlights to the snowman with a white gel pen. I also added some shimmer to him with my Wink of Stella glitter brush.